Manila, 11 August 2016 – Epson Philippines Corporation continues to strengthen its nation-building activities for various communities in the country. 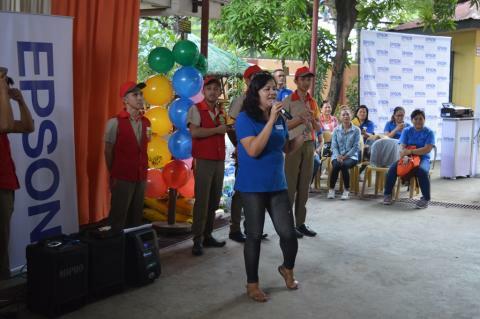 As part of its annual activities, Epson Philippines encourages its own employees to take part in CSR initiatives. Among these CSR efforts was the special activity held in Bahay Tuluyan Home for the Girls last 16 July 2016. Through exciting games and activities, Epson employees joined in on the fun, spread good spirits and put smiles on the faces of girls aged from 2 to 17 years old. As part of their outreach efforts, the Epson team also donated sacks of rice, personal hygiene products, a 40” LED TV and an Epson L120 ink tank system printer that Bahay Tuluyan Home for the Girls wholeheartedly received. “Epson Philippines also gives importance to making a deep impact through long-term initiatives that are focused on helping groups that aid the youth and champion education”, shared Ms. Beth Alcantara, Department Head of HR and Admin, Epson Philippines. “We are constantly in search of ways and means to provide support for various groups in the Philippines similar to Epson Philippines’ Gift of Brightness Program which is done in partnership with the Department of Education to provide Epson printers and projectors to public schools to help address the shortage of educational resources particularly in poverty-stricken areas in the Philippines”, Ms. Beth Alcantara further added. “Epson Philippines is positive that through specific efforts such as the recent CSR activity for the Bahay Tuluyan Home for the Girls, we can be an instrument of change in the country”, concluded Ms. Alcantara. Bahay Tuluyan Home for the Girls is a non-government organization that provides programs dedicated to help prevent and respond to abuse and the exploitation of children in the Philippines. The organization actively delivers social services in different communities in the Philippines such as Manila, Laguna and the Quezon province.